Several weeks ago, as the weather turned colder, my family introduced me to great place for food and fun, located in downtown Toronto. 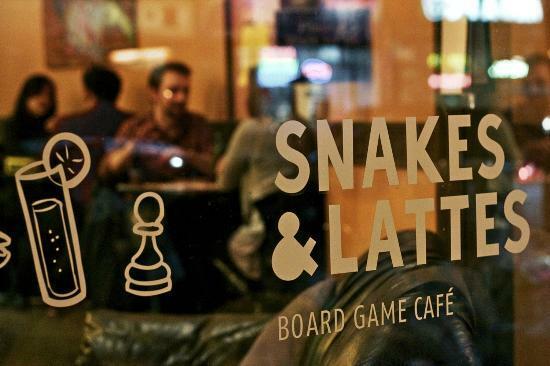 Snakes and Lattes (S&L) is Toronto’s original board game café where you can dine and play games for as little or as much time as you would like. With over 1,000 games to choose from, there truly is something for everyone! S&L now has two downtown locations. The original location first opened on Bloor Street in 2010, and after much success, they opened their second location on College Street in 2015. Both locations offer guests a dining experience, however, Bloor Street is more of a cafe, while the College Street location has more food and beverage options. Of course, the food is almost secondary, to the main reason for going to Snakes and Lattes…..to play games. In fact, if you enjoy any of the games that you play, they also have an area of the store where you can purchase games (I believe they are the only place in the city to buy the popular game, Cards Against Humanity). The staff are well educated and can suggest age appropriate games for your group and give you details on how to play each game. This is pretty impressive given the number of games S&L offers. The games are divided into zones like card games, strategy, fantasy and more. Some of the games are ones you have probably never heard of but they do indeed exist! Snakes and Lattes does not take reservations so it is good to get there early, but if there is a wait, they will take down your number and text you when a table is available. Even if you have to wait, it is definitely worth it! S&L provides a fun evening out where you and your friends or family can partake in something a bit different than just going out for dinner or drinks. It’s an especially enjoyable place to go during the cold winter months. Don’t be surprised if you get hit by the bug and end up buying a game you played that night….it’s happened to us more than once. Alternatively, you can also purchase games from their website.